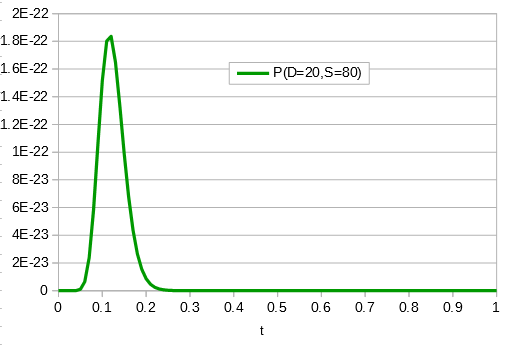 In an earlier post I went through a derivation of the Jukes Cantor model (based on a Poisson distribution of mutation events) and got the following type of relationship. where is the fraction of divergent sites between two DNA sequences and is the time the sequences diverged from a common ancestor in units of where is the number of generations and is the per generation per nucleotide mutation rate. to convert an observed difference between two sequences into a corrected estimate of the divergence between two species. However, this is only a point estimate and cannot handle cases where the fraction of sites that differ happen to be above 75% (this is possible by chance but becomes a log of a negative number and undefined). We can rewrite this in a different way, as a binomial probability, and evaluate the probability of a data set over a range of divergence and place intervals around our point estimate. 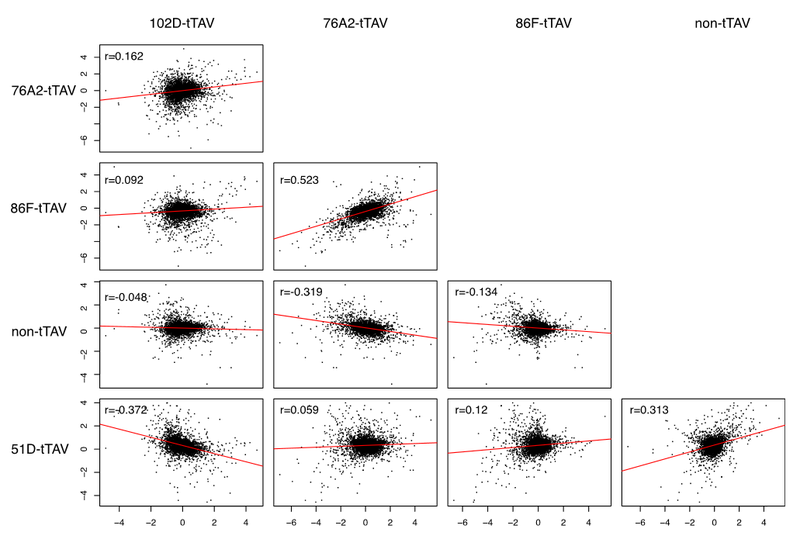 Assuming each nucleotide is independent in a comparison of two sequences we can multiply by the number of sites that are different, . Since there are only two possibilities, the sites are the same or different, and the probability of all possible outcomes must be 100% we can rewrite this in a slightly simpler way. Then multiply everything together to get the probability of the data including sites that differ and sites that are the same. There is also a binomial coefficient that should be multiplied to get the exact probability (because there are different ways to get the same data: the first and second site can be different, or the first and third, or the second and fifth, etc.). However, for a given data set this is a constant and we're going to drop it for the moment. Say we align two sequences of ten base pairs from the same gene in two different species. The sequence differs at two sites. We could rewrite the comparison as a 1 if the base is the same and a 0 if they are different. Making a plot of the two parts of the equation we can see that the probability that two sites are the same goes down as the time of divergence increases and the probability that they are different increases. Importantly, there is a middle ground that can best accommodate both signals from the data, the differences and the similarities, near but lower than the crossover point. 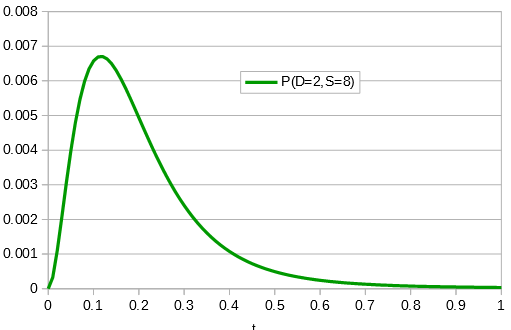 Combining these together we get the curve of probability of all the data with a peak just above 0.1. This can be integrated to find upper and/or lower confidence intervals (which is messy and uses the hypergeometric function); however, it is clear from looking at the curve that a wide range of values are hard to rule out with a data set this small. If the data set were larger we can narrow down the confidence interval. Plugging in and gives , exactly the same as with the other method. 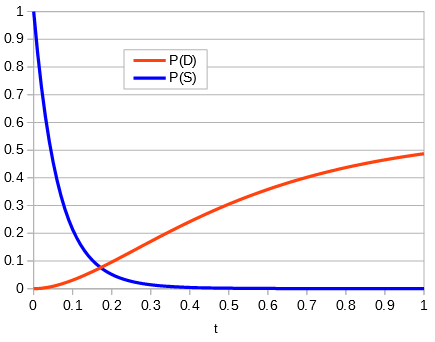 The original Jukes-Cantor method is a maximum likelihood point estimate (the parameter value of the model that maximizes the likelihood of the data). You can also see it is equivalent in other ways. The in the denominator makes the log evaluate a negative number if the fraction of sites that vary are greater than 3/4 of the total, which is undefined. 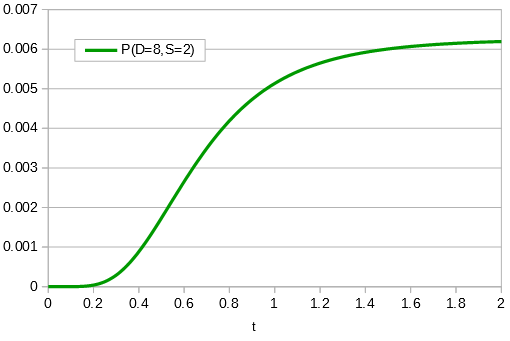 (Thinking about this intuitively it is most consistent with positive infinity; however, I suspect the curve gets infinitely flat and almost any large number is essentially just as likely.) However, we can still work with the probabilities which allows us to rule out small values of as in the example below where the sites that differ are 80% of the total. where is an element of the integers. This is fun because it combines a base log with and , but this isn't really relevant to the discussion (time of divergence doesn't rotate into a second dimension). This entry was posted in Uncategorized on February 2, 2018 by Floyd A. Reed. First of all there has been a long lag in posting any updates here about the lab. There are many things going on that are a higher priority at the moment; however, I also want to try to keep a certain tempo of posts and updates going here if possible. So, I set aside a few minutes today to make a post. 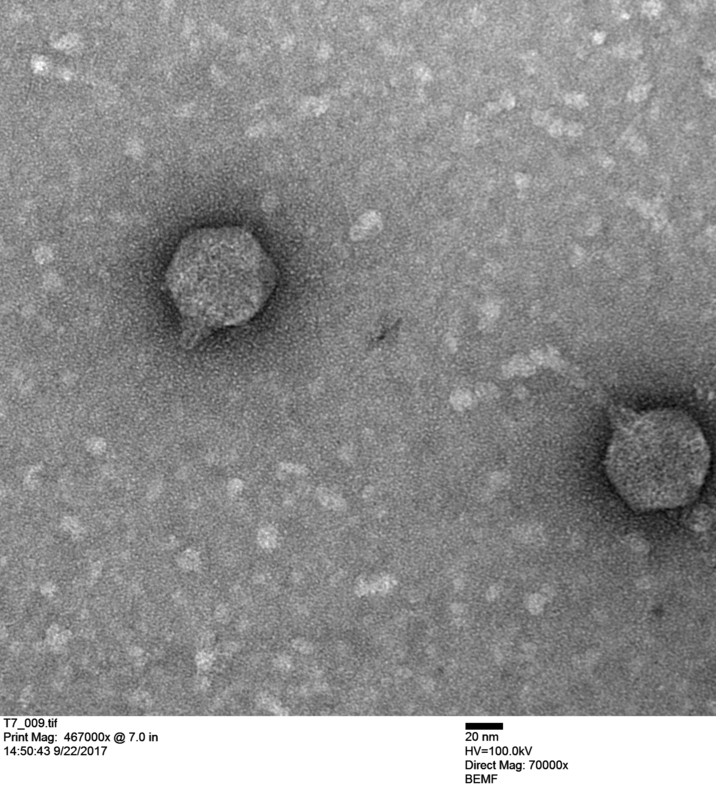 A couple of undergraduates in the lab have an interest in viruses, specifically bacteriophages. 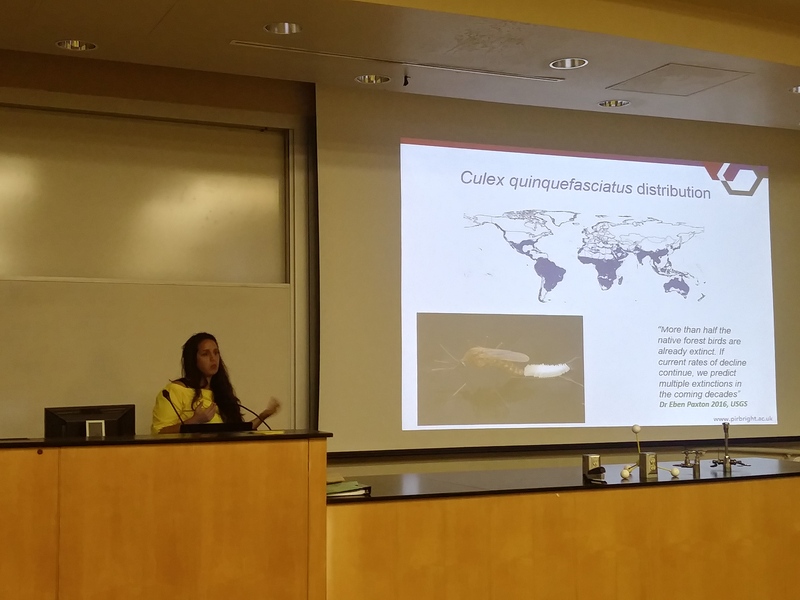 They have worked out methods to isolate and propagate the phages for various experiments. However, we wanted to get a look at the actual viral particle instead of inferring it indirectly from plaques on a plate of bacteria. I talked to Tina Carvalho at our Biological Electron Microscope Facility and she was enthusiastic about imaging the viruses. Negative staining is a relatively quick and easy method to get viral mugshots. The virus particles are put onto a thin membrane held in a metal grid and electrons are beamed through both the virus and the grid to get an image. The problem is that this doesn't really work that well. The virus is very transparent to electrons and they will pass right through almost like it wasn't there, i.e., the image contrast defining the virus will be low and look faint. A stronger image can be made by adding a thin fluid of uranium salt (Uranyl acetate (UO2(CH3COO)2·2H2O)). Uranium is very dense and good at blocking electrons. If all goes well (and Tina pointed out that there can be quite a bit of luck involved with the color of you socks that day possibly playing a role) the fluid will dry a bit and form droplets around the virus particles by adhesion. The electrons pass through the virus, which is making a path of sorts, through the uranium drop, so the outside shell of the viral surface can be better resolved. 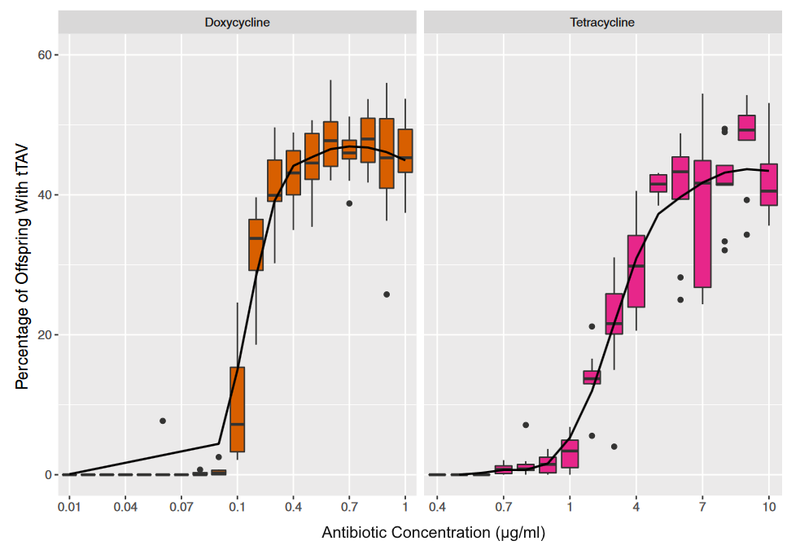 Here is a figure to try to illustrate. First we looked at a Vibriophage that Stacy Paulino isolated from seawater from Maunalua Bay. 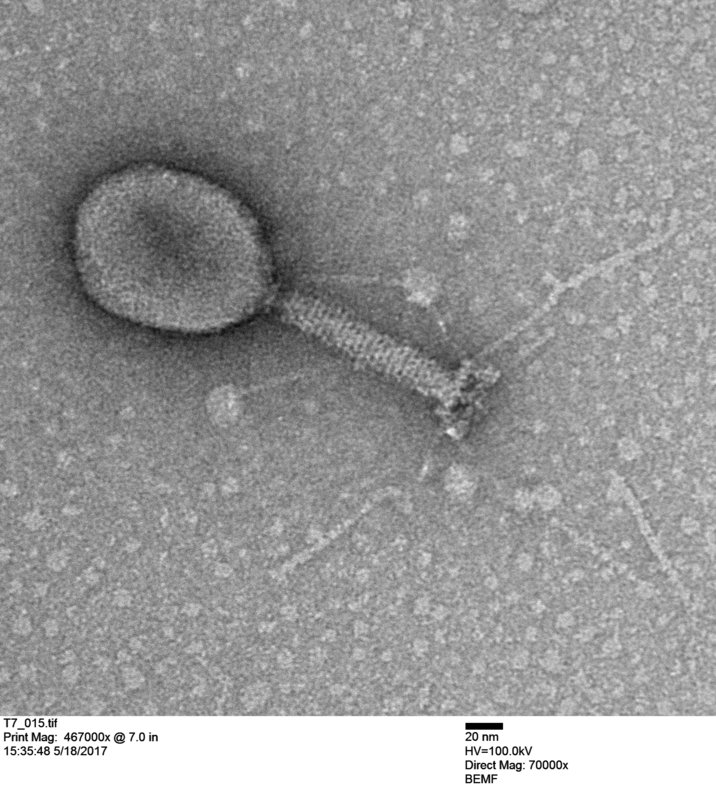 This phage infects a coral pathogen, Vibrio coralliilyticus, and Stacy imaged it below. 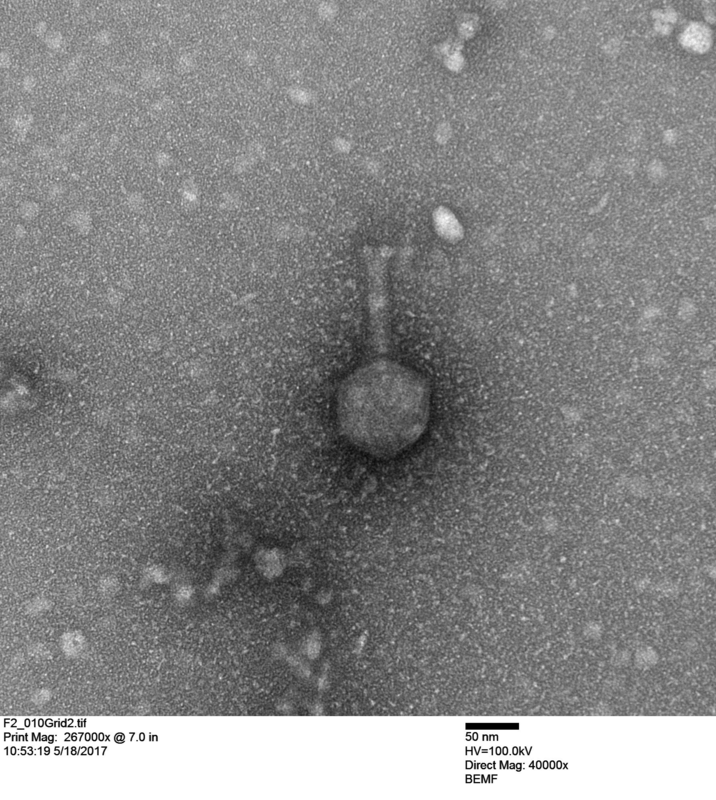 The next image is an unknown coliphage (infects Escherichia coli). 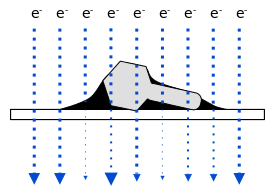 Notice the scale in the image indicating 20 nanometers; that is the size of a ribosome. Double stranded DNA is about 2 nm wide of 1/10 of the scale bar. The graininess of the tube is from individual tail tube proteins, single polypeptide molecules, which are typically assembled from ~250 individual peptides. Maya Shaulsky (in a collaboration with Bob Thomson) is working with T7 (below) and made these coliphage images. Originally we thought we were working with T7 coliphage but we kept getting frustrating results that didn't make sense. When we actually saw the virus (the image above) it confirmed that we were not working with T7 so we ordered actual T7 from a different stock center. 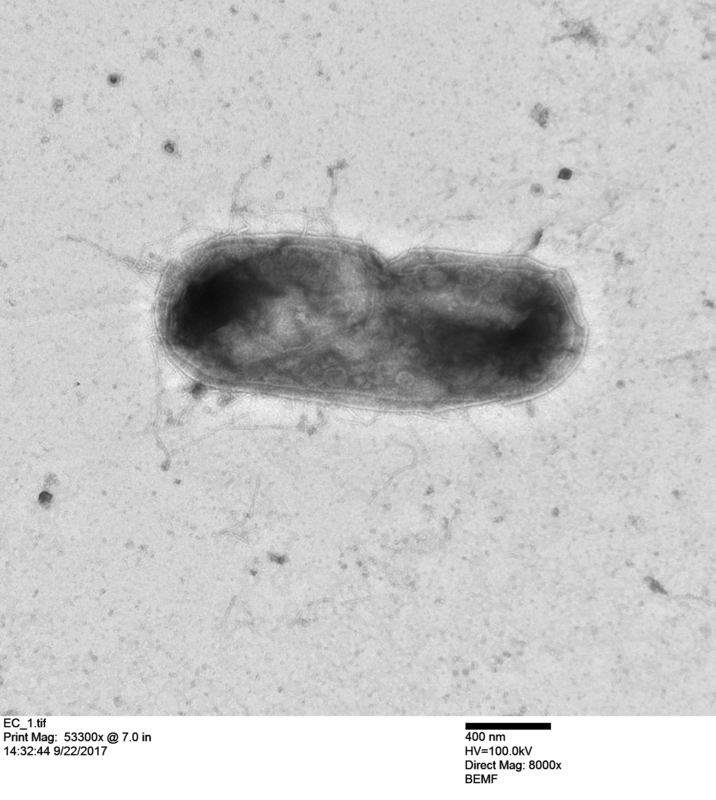 And here is an E. coli bacterium with T7 particles replicating inside the cell! If you are working with something small I encourage you not to be intimidated with the idea of electron microscopy imaging. It is really something to actually see what you are working with. The protocol to prepare the specimens is not that long or difficult (some people may disagree with this, perhaps we have been lucky) and it is not really that expensive to pay for the training and machine time. It is worth trying at least once. This entry was posted in Uncategorized on November 17, 2017 by Floyd A. Reed. 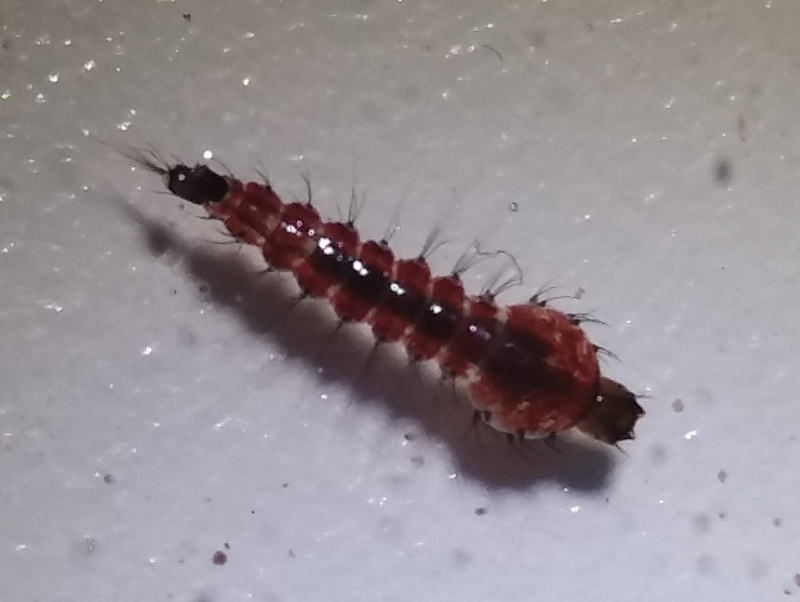 An alternative GAL4-based genetic sterile insect technique? Here is a thought that came to me on a walk. Perhaps this could also be applied to mosquitoes to suppress wild populations. GAL4, UAS, and GAL80 are genetic tools from yeast that are commonly used in Drosophila. GAL4 is a protein that drives expression of genes with UAS (Upstream Activation Sequence) as a gene expression enhancer. GAL80 inhibits GAL4. So, place the gene encoding the GAL4 protein under UAS expression. This could create a runaway positive feedback loop (GAL4 drives its own expression of more GAL4) and result in lethality. However, set this up in Drosophila that also express GAL80 to inhibit the GAL4 from binding to UAS. If GAL80 were expressed from a Y-chromosome only male offspring would survive to mate with the remaining females. Female-specific lethality is a powerful way to suppress a population. This could be set up in a stable lab Drosophila stock using compound X chromosomes for X^X Y females and regular X Y males. All the Drosophila stocks, sequences, and insertion sites exist to quickly try this out. This entry was posted in Uncategorized on July 19, 2017 by Floyd A. Reed. A lab publication is out (link)! Áki J. Láruson generated the mitochondrial genome of Tripneustes gratilla and compared it to all other existing sea urchin genomes. 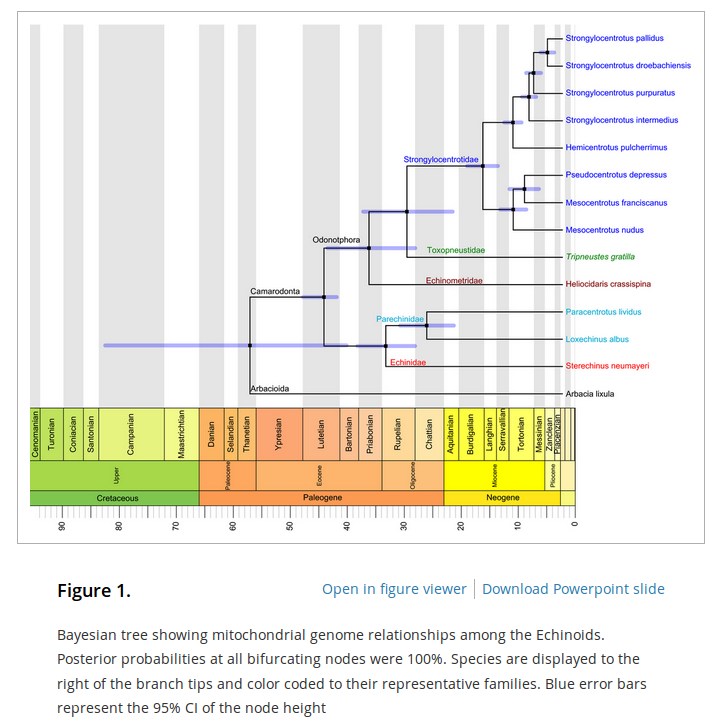 He found that the Toxopneustidae are a sister family to the Strongylocentrotidae splitting from each other around a time of major climate change (link) and that patterns of DNA substitutions are generally consistent with neutrality for the sea urchin mitochodria. Stay tuned for more Tripneustes gratilla genomics publications! This entry was posted in Uncategorized on May 18, 2017 by Floyd A. Reed. In an article recently posted at NIH a plan to limit individual grant support has been announced. NIH is facing the fact that (1) there is not enough grant funding to go around, (2) the funding is being concentrated into fewer labs (3) at fewer institutions, and as a consequence (4) science is loosing young researchers because the field appears to have no future for people starting out. Without a next generation, science in the US is approach a crash in its workforce. In response NIH plans to spread out research funding among more researchers by placing a cap on individual funds received. Why stop at three? I would be overjoyed with just one or two R01 grants to allow me to do my job. This entry was posted in Uncategorized on May 4, 2017 by Floyd A. Reed. We can read the steps of the scientific method and know about conventions such as the peer review process but at its core what is science? I have been thinking about this question more and more recently. In trying to pin it down the definition seems to diffuse into a overly abstract statement that resembles something I dislike as a shortcut to thinking and refer to as "bumper sticker philosophy." It seems odd to phrase it this way but science is, in a way, about what works and what doesn't work, and understanding the reasons why what works and what doesn't work in a very rigorous way. Science, ideally, is a careful balance of keeping an open mind, embracing curiosity, taking details seriously, and reasoned agreement and disagreement with others. Then there is the real world human aspect of how science is or is not practiced. Statements such as "believing" in evolution or "believing" in climate change do not sit well in a scientific perspective. In current American English this implies faith in something... However, pointing this out can be misinterpreted and hijacked by people with non-scientific motivations. At the risk of sounding like a kōan, I thought two famous historical case examples, one from physics and one from biology, that have interested me for different reasons, might provide more of an illustration of what science is then trying to nail down a precise verbal/text definition. However, this comes at the risk of people not being patient enough to read them. Perhaps therein lies part of the modern problem. If it doesn't fit into a snappy short phrase it never reaches most people. I've linked PDFs of the two examples below. This entry was posted in Uncategorized on April 25, 2017 by Floyd A. Reed.